Graduating senior Devan Cole speaks about racial injustice he witnessed throughout his college career at the MSSC Multicultural Graduation Celebration Thursday. Graduating seniors gathered in Lisner Auditorium for the 10th annual Multicultural Student Services Center graduation ceremony Thursday. The celebration consisted of multiple keynote speakers, awards and student speakers representing various multicultural communities. The ceremony concluded with the graduates receiving red stoles to be worn during the University-wide Commencement Sunday. She said graduates should take in all they have learned during their college careers and “take stock” of the strength and perseverance they’ve gained throughout their time at GW. In his speech, Tapscott gave advice on a variety of topics like hard work, spirituality and empathy. The speech wrapped up with Tapscott thanking the students for allowing the MSSC to be a part of their college experience. “It’s our hope that you leave here knowing that you were important to us, that you mattered to us and that you always belong here,” he said. 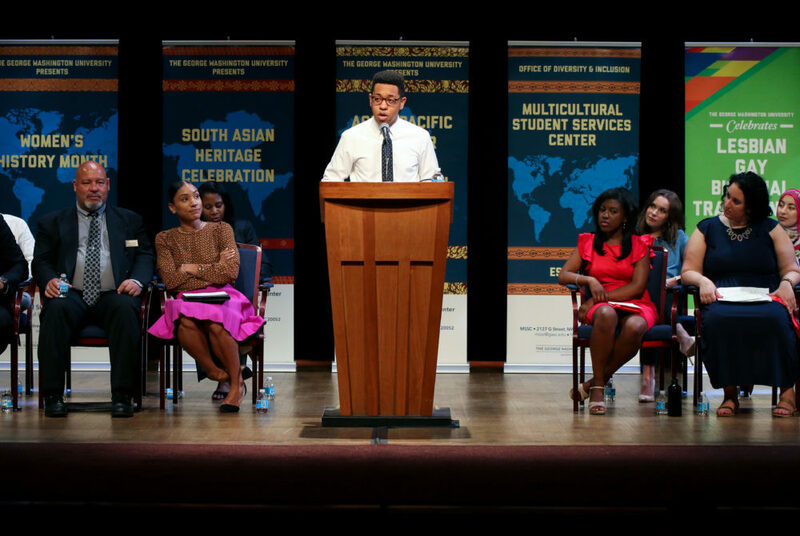 Joseph Verghese, who represented the Asian Pacific Islander community, also touched upon the community that was cultivated through the MSSC. Devan Cole, who spoke representing GW’s black community, discussed racial injustices on and off campus. Cole spoke in detail about a Snapchat post that included a racist caption that was circulated on campus earlier this year. He said the time and dedication of the black community following the spread of the post led University President Thomas LeBlanc to pass initiatives to improve the campus experience.